Teaching international business to today’s students is different, isn’t it? Has international business also changed? Four European Universities (Katholieke Universiteit Leuven from Belgium – the project coordinator; University of Leeds from the UK, University of Ljubljana from Slovenia – whereby the Centre of International Relations is managing the project at UL; and Poznan University of Economics and Business from Poland) and a partnering enterprise (El Izi Communications Consultancy from the UK) have joined forces to tackle the current challenges of teaching international business and design innovative international business teaching tools. 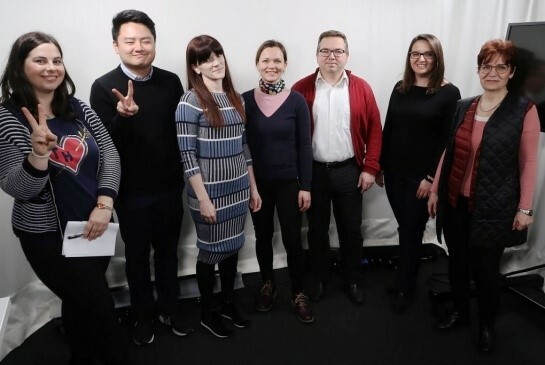 As part of an ERASMUS+ project, titled ‘Open Access Digital Video Case Library for Teaching International Business’ (VCL4IB), the five project partners will create an open access digital video textbook (i.e. a library of videos) for international business. This innovative ‘textbook’ will facilitate more attractive and engaging teaching in both higher education and vocational education and training. In the ‘textbook’, the traditional textual chapters usual for teaching materials will be substituted by videos. This means that the entire content will be delivered in a video format. Videos in the ‘textbook’ will cover relevant international business topics through presenting real-life cases from different countries and industries. Evergreen questions on when, where, and how to internationalize, as well as on how to deal with risks in global business, will be addressed through up-to-date solutions from CEOs and other international business practitioners. Practical examples will also be complemented by theoretical explanations – including some of the most recently developed international business theories. In order to enhance experiential learning, students using the digital video textbook will first be exposed to a case (i.e. a problem). Theory and in-class Q&A sessions will follow. The first video cases will be tested in 2020, while the full video textbook will be published and freely available in 2021. The project was launched in September 2018. Since then, a survey on the needs and barriers on video teaching in international business (both from students’ and professors’ perspectives) for the video textbook quality and relevance assurance was already conducted. Its preliminary results were presented at the 44th European International Business Academy (EIBA) conference, which took place in Poznan, Poland, in December 2019. In February 2019, all project partners also participated in media trainings at LIMEL KU Leuven in Belgium to upgrade their video preparation and e-lecturing skills for further project work. More information about the Centre of International Relations can be found here.